Three elegant, vibrant grandmothers I met at the shul invited me to join them for coffee and angel cake. They were from a New York religious community I know nothing about, and I was in the mood for a bit of adventure, so I agreed. Our hostess told her friends that after she had been sweating in the kitchen for days, her daughter had flown in for the 3-day Yom Tov with her husband, 8 children, and nothing more than a box of black-and-white cookies for her mother. Her friends clucked their tongues in sympathy over the daughter’s insensitivity. The conversation wandered back to the $35,000 vacations, but I couldn’t move past the story about that daughter and that box of cookies. I imagined myself as that daughter. I imagined walking into my mother’s home and only being able to think of how difficult the flight had been with a teething baby, and what a relief it would be to not have to cook for Yom Tov, and how incredibly thoughtful I had been to shlep overseas in order to spend the holidays with my parents. How jarring to all of a sudden see young mothers, myself included, from their mothers’ point of view. How often, I wondered, had I seriously consider the feelings of my parents or in-laws? How often had I thought of how hard my parents/in-laws worked to pay for a flight or to send new Shabbat dresses for my kids, or even to host a noisy crowd of Weisbergs for a week or two or three? I say “Thank you” of course. And I call, and I send photos, and I pat myself on the back for waiting 20 minutes in line to send the annual nursery school Shana Tova cards. But listening to those grandmothers, I realized that that mother with the black and white cookies was me. When I was 3 years old or 11 years old or even 18 years old maybe I was entitled to my parent’s generosity. But at 38 years old, that feeling of entitlement should definitely be replaced by intense gratitude for everything my parents and in-laws do for me and my family. And finding concrete ways to display that gratitude, I realized, is something I need to start working on ASAP. *She is only willing to listen to suggestions from matchmakers when she completes her post-high school seminary year. Mazal Tov to Recovered Groom-Soldier Aaron Karov and Wife! I listened to you speak from your heart about Chagit bat Leah, may she have a refuah shelaimah b’karov, and I put in tzedakah for her refuah. (I don’t understand why natural healing cannot take place together with painkillers – but I am no expert.) You now thank Hashem for being able to breathe and walk without pain. I listened to the aish video, how to be miserable – well done! I looked at Gilad ben Aviva’s “succah,” and put in tzedakah for his release. 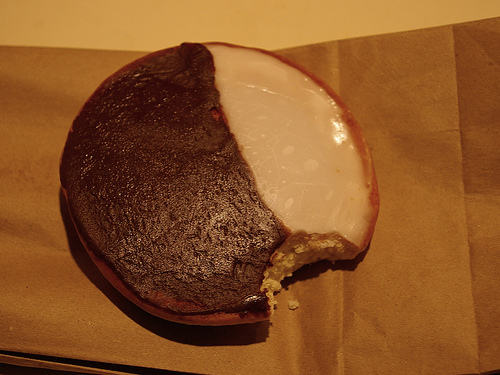 And I read your essay on the black and white cookies. Chana Jenny, it is your humility that is at the core of the fast-growing success of this website. You humbly allow yourself to learn and grow, and you take your viewers/readers along with you on that journey. I agree with Rische – its amazing how Hashem puts us in our place…literally- just thnk how He put you there to get your mothers perspective and wake up and wake us up too…I never thought of grandmoms side of things – I only thought about how I am dealing with bringing the kids overseas…I mean I feel guilty when we are there and theres a constant mess but I know its just for a few weeks, and my mom says she misses the mess…but getting her a meaningful appreciative gift is definitely called for- a massage & a day at the spa is probably the best gift- especially following my visit…Hag Sameach and thank you. I don’t know. It’s so hard traveling down the road with a brood. i think that the fact that she even came for succos is wonderful. That she was able to schlep an additional box just for a special treat for her mom, in addition to being able to spend time with her grandchildren that she sees how often? It’s hard work ffor the grandmother, cooking for a brood, and she did it herself for a long time, but now…I know we should show more appreciation, but I don’t think the grandmothers were all correct with their complaints. I am in my 50s and (coincidentally!) so are my friends. B”H we are blessed with married children and grandchildren. Many of my friends seem to like being martyrs. “My children only want to come to me for all the yom tov meals. I wish we could go to them for a few, but nooooooo…” I would like to say to those friends, “Nobody takes advantage of you without your permission.” Why are some of you older mothers out there ALLOWING your children to take advantage of you, and then you are complaining behind their backs? Just tell them how you feel straight. Be clear about what it takes for you also to enjoy yom tov. This is what I do. I have ka”h kein yirbu five married daughters, all with children of their own. They come to my house for meals — by invitation. They always ask what they can make or how they can contribute. This happens only because I made it clear that this is how it must be. I am not here to cook, clean and slave for them. We are ALL here because we want to do yom tov as a family, together, and enjoy it. To enjoy it, I need a lot of help. From them. They are grown up now. My obligation to take care of them has long since ceased. But their obligation to take care of me never ceases (just as I am now busy helping my parents, and hope to do so til the coming of Moshiach). Isn’t it our job as older mothers NOT to let ourselves be taken advantage of, and then complain, but to continue to show our children the right way to behave? My married children are now so proud of how much they help me. They are proud that sometimes they make Shabbos and yom tov for me, in their houses. They are happy that when the older mothers are complaining about all the work they do for their children, their mother is not complaining. She is reveling in the nachas. You made a few good points. Thank you. i agree with sima- its not easy to be a mother with 8 kids flying in for yom tov …in my family we only have to drive an hour and a half to my in laws and that is hard enough! if my MIL expects i bring something she lets me know outright and i make sure to make or buy it, but otherwise she doesnt expect anything and even comments about how she appreciates our efforts in coming with the babies in tow…of course that grandmother in the article deserves a lot of appreciation for her hard work, but im not sure how appropriate it is to vent her frustration to a group of friends plus a stranger she just met- it would maybe even be lashon hara? shouldnt she have just talked about it to her daughter privately? Maybe it is not “one ditch or the other” – we can always have the “best of both worlds” if we have the intention. I have a married daughter with children and sometimes I “surprise” them with a full course meal to just come and enjoy – whether on a special day or not. The atmosphere of appreciation itself is worth the work – AND – it makes the next “dual-work” meal still as sweet. And, also, when she knows I have a full scheduled day ahead, she will call me and let me know that her dad and I are welcome because she threw in a little extra. I think it is really a matter of perspective. we both need to think about both our own inconvenience but others as well. When I go visit my parents overseas they don’t wan me to bring presents since they really don’t need anything and don’t want us to spend money on them. Te gift for them is to see their sweet grandchildren. From time to time I sneak a gift, but nothing can really repay them for all teir work for us. he has a great story about attitude and perspective in parents (you can catch it at 12:45 in the recording. I recommend it.